The most challenging part of performing at the Coachella Arts and Music Festival on the second weekend is keeping the set fresh from your first weekend. 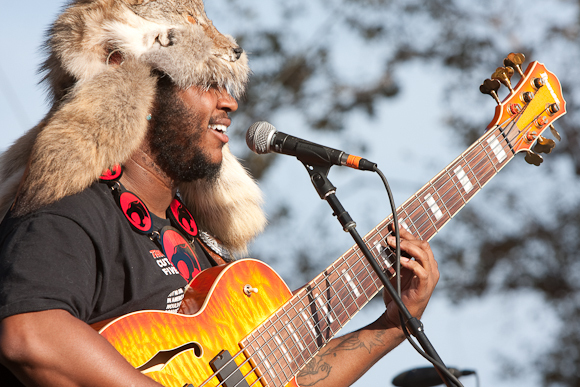 Thundercat was able to avoid a stale perfromance by switching up his crazy hat and who he brought on stage with him. The first weekend he had Michael McDonald duet with him and for his second appearance he had comedian-musician Reggie Watts up there with him for a couple songs, as reported by Billboard. The bassist sported a crazy pelt hat in weekend one and followed with a GWAR inspired helmet and spiked shoulder pads for this performance. A short Youtube clip of the performance can be found below along with a Twitter post that includes some photos. “The Late Show” band leader and Thundercat performed at the Mojave tent and while the performance was itially plagued with sound difficulties, Watts was able to salvage the hiccup with improvisational vocal riffs and an pverall special performance.